Women in India have come a long way. Taking care of household chores and family members is no longer their preoccupation. With equal access to education and employment Indian women , especially in urban sector are everywhere, studying and working and making the country proud in every sphere of life just like their male counterpart. However, although this transformation of women's role in society is admirable, this has a flip-side as well. Urban women put in valiant effort to strike a balance between their focus on work-front and homely affairs. In a bid to make both ends meet women tend to fall prey to unsound lifestyle which in turn takes a toll on their health. Lack of proper sleep and exercise coupled with unhealthy food habits are paving way for a host of ailments among young women in India which were once associated with older folks. Most working women in India suffer from stress and anxiety that lead to depression and even psychological disorder. Instances of diseases like diabetes, thyroid, infertility have increased by leaps and bounds over the last decade. The trend of life-threatening ailments such as cancer is also upsurge among young women in India. According to the survey, an increasing number of younger women in India who are in their thirties and forties being diagnosed with breast cancer. As the chart suggests, there were only 2% patients of breast cancer in the age-group of 20-30 years 25 years back but now 4% patients belong to that age group. In the age-group of 30-40 years also a rise of 16% breat cancer patients from just 7%. And also in the next age-group of 40-50 years breat cancer patients have risen from 22% to 28%. 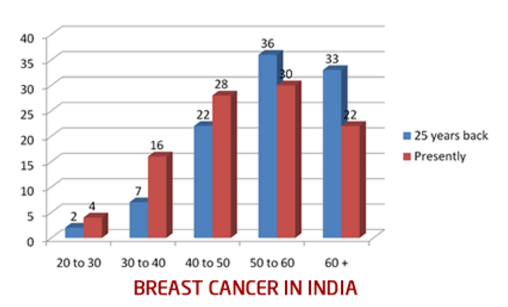 So, a whopping 48% breast cancer patients in India are in the age-group of 20-50 years. The trend clearly suggests that this deadly disease is spreading fast among younger section of women and this well and truly requires evasive action. Apart from the outbreak of life-threatening ailments, spiraling cost of medicines and treatments also calls for a comprehensive protection. This is why health insurance is indispensable for women in India. A comprehensive health insurance online policy provide an array of benefits in return of an annual premium which is insignificant compared to the wide coverage it offers. Having understood the needs of Indian women especially the working ones, some health insurance companies have come up with health insurance online policies that are designed exclusively for women in India. Most of these health online insurance covers offer protection against critical illnesses including different types of cancers that typically affect women only. While buying health insurance online, women in India should consider a few other aspects aside from the list of diseases it covers. Here are the aspects of health insurance that require consideration. Finding the best health insurance in India for Indian women is quite tricky. The 'one size fits all' approach doesn't work here. The requirements of women differs with different age and social status, so what seem to be the best health insurance for a single woman in India might mot work for a married one. Let's take a look at what types of health insurance policy suits women in different stages of life. The best health insurance for a single-married woman is a comprehensive health instance online policy. Depending on budget, they can also avail critical illness policy alongside the base cover. Single women parents in India can opt for a comprehensive health insurance plan online that can also protect their children. Single parents should ensure that their chosen health policy covers vaccination expenses. A newly married woman in India should look to avail a health insurance online plan that offers maternity benefits. Health covers differ in terms of waiting period for maternity coverage so they should compare health insurance to trace out the health insurance plan with least waiting period for maternity coverage. Family health insurance plans are the best options for Indian women that live in joint families. There is no dearth of family-floater health insurance plan in India so women should compare health insurance online in terms of the coverage, premium, limitations and exclusions. Women in India who are more than 60 years of age can avail senior citizen health insurance plans which are designed exclusively for them. Elderly women in India should try and avail a health cover with lifetime renewal option and post-hospitalization benefits such as nursing. When it comes to best health insurance in India for women, there are two health online insurance plans available. These two plans are launched by two reputable insurers in India and offer a wide range of benefits. Here is are the beneficial features of both these women specifiv health insurance plans in India. Protection against 11 Critical Illnesses. Cosmetic Reconstruction Surgery benefit for accidental injuries. Aside from the above-mentioned health insurance plans for women in India this health cover is also designed for girl children along with their parents. People in the age-group of 18 years - 65 years are eligible for this health insurance policy. Girl children in the age-group of 3 months - 25 years can avail the coverage if they are dependent financially on their parents and if both or one parent is covered at the same time. The upper limit on age is not applicable for mentally challenged and unmarried dependent daughters. This Policy is designed to give protection against hospitalization expenses and accident coverage to spouse and proposer. Women in India often neglect their own well-being. Oftentimes they don't give the due importance to their own health hazards and they also remain caught up in taking care of their families. But, it is crucial that women in India start looking after themselves, especially in the wake of rising life-threatening diseases. If you want to buy health insurance online for women in India, the earlier you do the better it is. An early enrollment will not only ensure reduced premium but also help serve the waiting periods well in advance. You can visit GIBL.IN, the premiere online insurance marketplace to compare and buy online health insurance policy for women in India. Grab the best health insurance in India that help take care of women in India.